Precision agriculture is all about more accurately understanding each field you farm. The yield monitor can help you increase profit by calculating ROI from different management practices. Calibrate. Calibrate. Calibrate! The importance of calibrating combine monitors can’t be stressed enough. For those who run a yield monitor, that screen can take your operation to the next level. 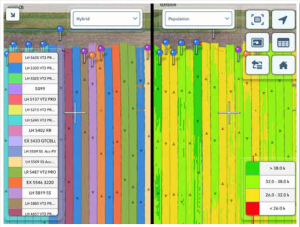 Accurate yield data can be compared from year to year and across different crops to establish areas within each field that must be treated/managed differently. Yield maps may be used to create zones for applying fertilizer, lime, seed, nitrogen and many other inputs. It’s important to place inputs in the right spots to provide the best return per acre. Even if you’re not implementing variable rate technologies today, you might someday. That’s why it’s so important to calibrate more than once and always when switching crops. Our goal with FieldXField® Crop Planning is to place the best hybrid or variety on each field based on the information available. Seed selection can add 40 bushels per acre (bu/A) on corn and 15 bu/A on soybeans! Placing the best genetics for a given environment pays. One valuable feature in the Climate FieldView™ (CFV) platform is seeing two maps at once while you’re harvesting. This is really helpful when harvesting a plot because it can provide a better understanding of how a particular hybrid/variety responds to a particular field. Evaluate those products on your farm. How are they standing? How are they coming into the combine? What is the moisture? How is late-season crop health where you sprayed fungicide? What is plant stature? Ear height? Take notes on how each hybrid physically responds to your field environment. Each field has a different overall environment from fertility and soils to disease pressures and climate conditions. Another advantageous feature within CFV, as well as within most monitors, is dropping pins and taking notes. If you’re noticing more tip back on your corn, drop a pin and make a note or drop a pin and take a picture using your phone. Perhaps the plant population was a little too high or maybe too much nitrogen was lost in that area, or maybe the problem stems from a deeper fertility issue that only a diagnostic soil sample can find. Grid sampling may be too coarse to catch a particular spot, but using precision ag tools allows you to plot what you’re seeing. Then you can go back later, when you have more time, and evaluate the data. When harvest ends, planning for the next crop begins. Keep diagnosing problem areas after the combine has been put away. Turn Precision Ag tools into profit! Feel free to contact me at the Latham office if I may be of assistance.